Mellow autumn has arrived with all the delicious apples and blackberries that have now finished ripening and so now clamour to be used in the kitchen. 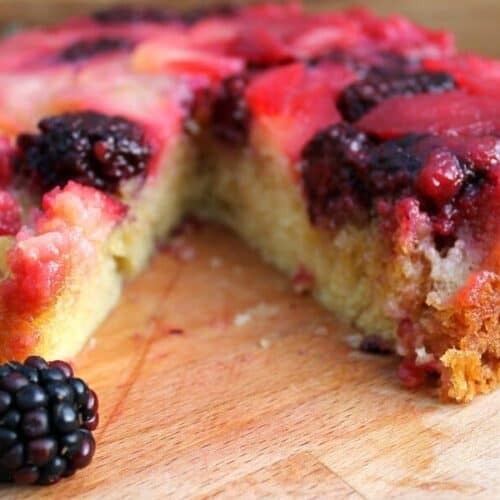 What better than to bake a blackberry and apple cake to make the most of them, and to make a bit of a change from a blackberry and apple crumble or pie, those autumnal favourites. 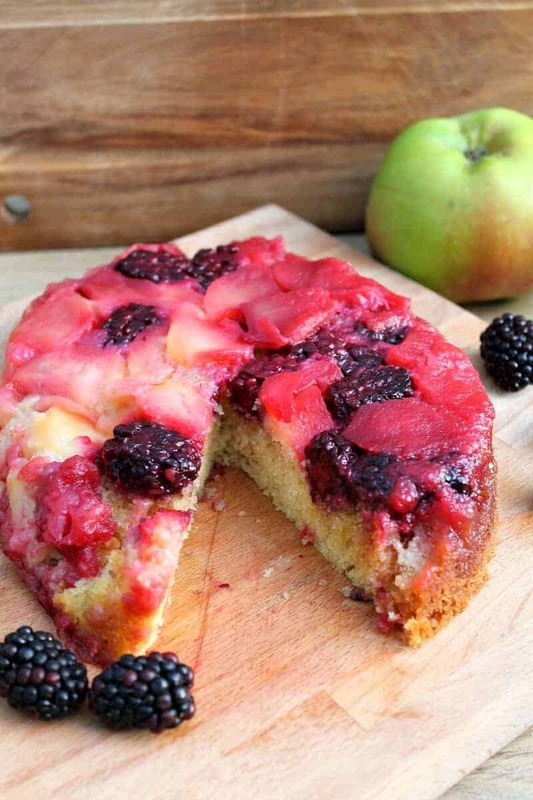 This blackberry and apple cake was baked in my slow cooker but could of course also be baked the usual way in the oven if you wanted to. But when you can get such good results, I think you should try making a slow cooker cake at least once! This is an upside-down style cake, where the fruit cooks and caramelises in the base of the slow cooker pot under the cake as it bakes. This type of cake is so fun to bake, I have a summery berry version of this cake too. 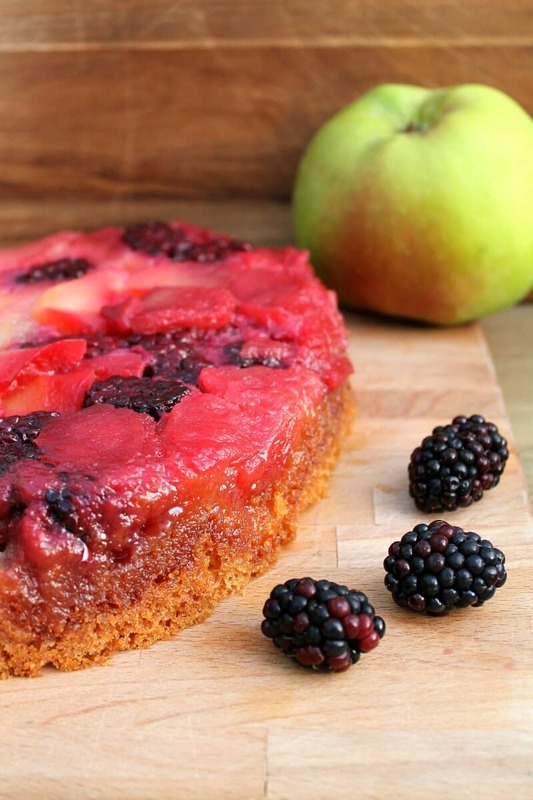 The blackberries stain the apple with their wonderful purple juice as they soften during cooking. I just love that colour! The cooking apples are macerated by sprinkling them with sugar before cooking, which draws the liquid out of the applies and stops them being so tart. 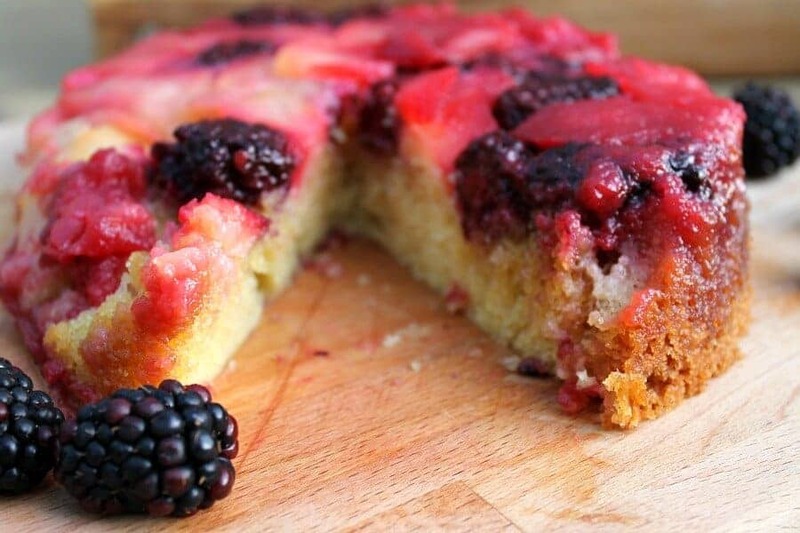 Bite through the layer of soft sweet and tangy fruit to the soft sponge cake below. It’s more like a dessert than a cake and is amazing covered in custard too! Why Bake a Cake in a Slow Cooker? You might well think, why would you make a cake in a slow cooker? I find it a good way to make cakes that costs less than running an oven and has less risk of burning. You still need to check your cake regularly and look out for burning but if it does happen it won’t just take minutes. 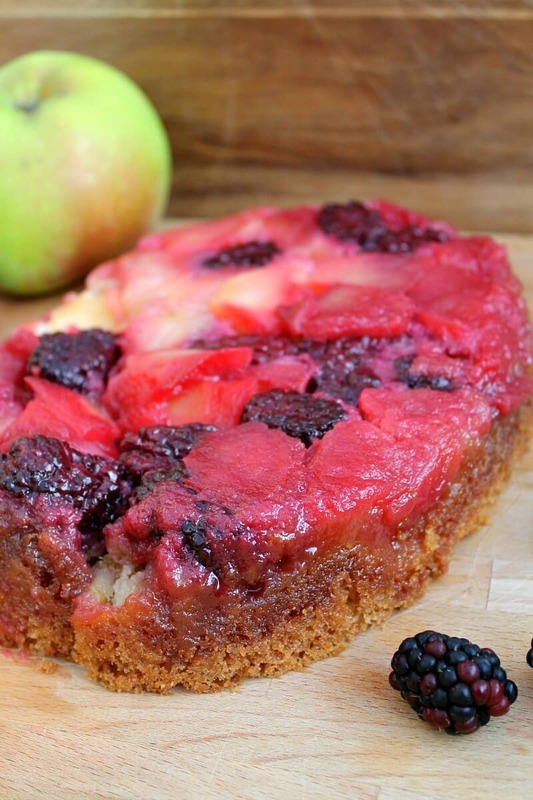 The fruit layer also protects the bottom of the cake from burning. Check out my post all about baking in a slow cooker (with loads more slow cooker cakes and dessert recipes too!) and get lots of tips in my post on how to make a cake in a slow cooker! 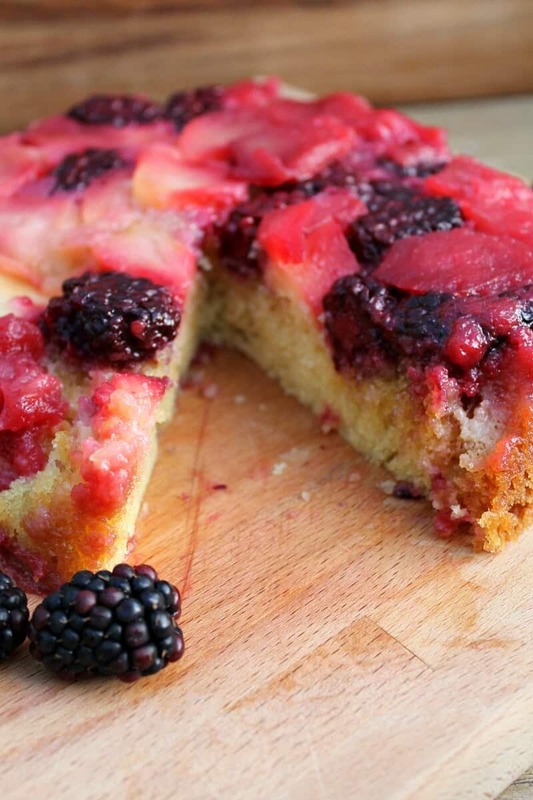 Pin this blackberry and apple cake for later! Prepare the cooking apple and mix with 25 g of caster sugar in a bowl. Leave for five minutes or so to absorb the sugar (it will draw some juice out too). Mix together the soft butter and second 25 g of caster sugar to form a soft paste. Spread this over the bottom of the slow cooker pot. This will allow the fruit to caramelise in the pot so make sure you spread it evenly and cover the whole base of the pot. 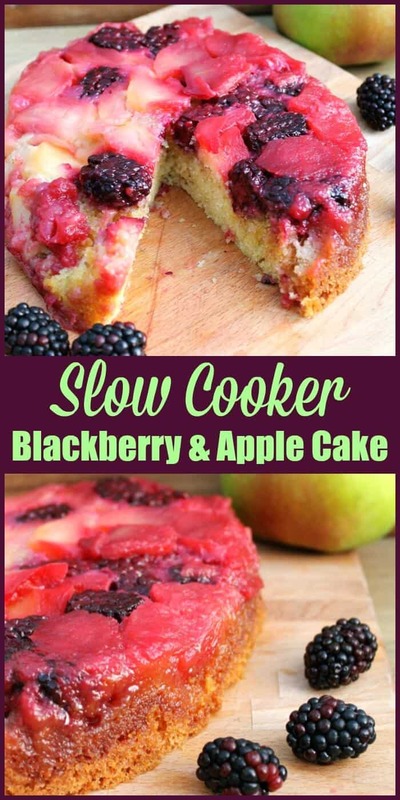 Place the prepared apple and blackberries in the base of the slow cooker pot. Put all of the cake ingredients in a large bowl and mix either with a wooden spoon or handheld mixer until well combined. 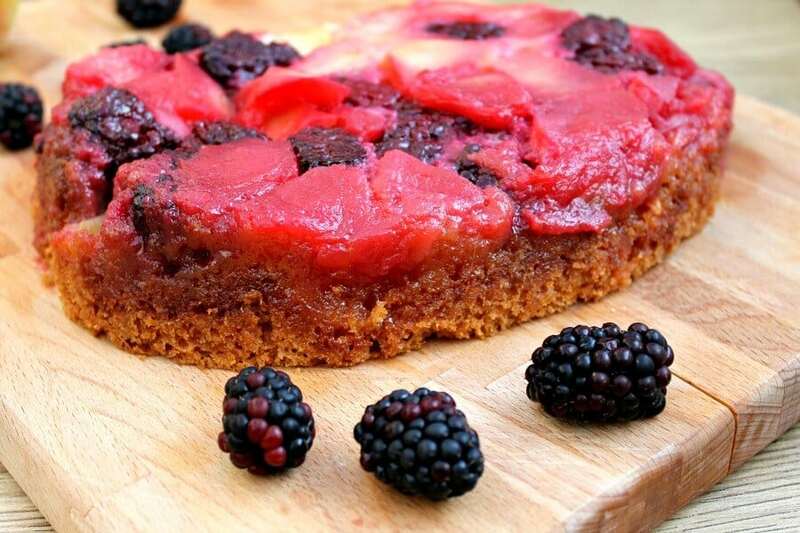 Spoon the cake mixture on top of the apple and blackberries and smooth it over so it goes right to the edges. Replace the slow cooker lid, with a tea towel added under the lid to stop condensation from dripping onto the top of the cake. Bake on high for 1.5 to 2 hours or until a skewer or knife comes out of the centre clean. Look out for burning round the edges, if it does, take the pot out and turn it around or turn the slow cooker to low. Once cooked through, remove the pot from the slow cooker, allow to cool slightly, then run a knife around the cake, turn the pot over, and carefully catch the cake on your hand. Be careful when doing this so the cake doesn't break apart, especially if it is still warm. If needed, let it cool for a bit longer. Transfer to a plate, slice and serve! I made this recipe in an oval 3.5 litre slow cooker. Times will vary depending on your slow cooker and its size. Look out for burning and take steps if you do see it is burning. Check the cake regularly.